1. After drinking, it is recommended to wait 20 minutes before testing, because alcohol takes about 20 minutes into the blood from the digestive organs, and residual alcohol in the mouth takes time to dissipate. 2. To get a more accurate result, the distance should be at least three minutes between each test. 3. Do not use benzene, gasoline and thinners cleaning product ingredients tester. 4. Do not allow any liquid penetrated into the sensor. 5. To remind you, to you and the safety of others , do not drink and drive. 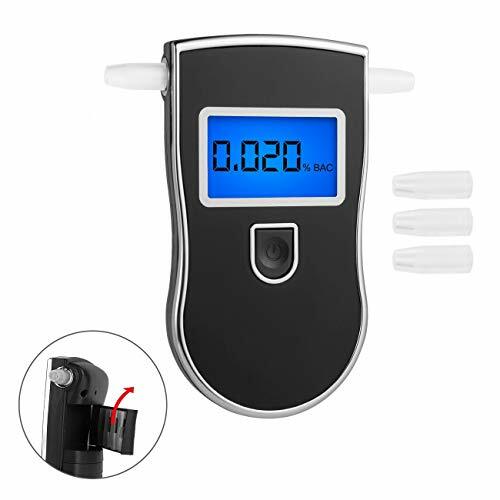 【SENSITIVE AND HIGH ACCURACY】 High accuracy, the AT-818 alcohol concentration alcohol tester is used to measure the human body, intelligent MCU control, when the test results more than 0.05% bac or 0.50 ‰ bac or 0.25 mg/l, or 50 mg / 100 ml, it warned audio and video, warn you. 【FIVE PIECES MOUTHOIECES FOR FRIENDS】Alcohol breath analyzer come with 5 pieces mouthpieces which are placed on the back of the device, and the mouthpieces can be cleaned and recycled. Will be much easier for your family or friend to test. 【ONE TOUCH OPERATION 】The breathalyzers are extremely easy to use. Simply insert the three included LR03 AAA batteries, power on your breathalyzer and begin testing. You are able to easily change units of measurements and set user-defined BAC thresholds for testing. 【PERFECT LED SCREEN】 With blue LED display, it will be much easier for night viewing. It will be auto shut off to save power after you finished the test for 20 seconds. LCD screen flicker shows that it is in low battery. 【SMART DESIGN AND SIZE】 This alcohol screener will fit into almost every shirt- or pants pocket. You will have the ability to check the alcohol value in your breath everywhere. It is also a good companion for breast-feed mothers who want to know whether they can feed their children or not after drinking through measuring their BAC (Blood Alcohol Content). If you have any questions about this product by Fannel, contact us by completing and submitting the form below. If you are looking for a specif part number, please include it with your message.